What specific products are made by Laurel Burch Inc. are the same as before this great American artist passed away in 2007. The world renowned jewelry will always be a favorite for many women but there is more. After her trip to China back in 1971, she expanded her talents to the art form of painting with enamel called cloisonné. This allowed her jewelry line to expand with this new art form and help her to reach into other areas of the art world including figurines. Today, anyone who admires and appreciates Laurel Burch art creations can enjoy them in a wide variety of items. Not only is there a wide assortment of earrings, but pins that a woman can wear. To help a lady with the other fashion accessories they will desire are the many handbags and tote bags. These match in the same style and appearance of the famous earnings that are the backbone of Laurel’s art creations. The bags and totes are sold in many different styles and sizes to fit the needs of any occasion from a night out on the town to traveling. To further help a lady accessorize with Laurel Burch fashion art would then lead you to the scarf collection. These scarves are made out of high quality silk that will shimmer and shine on any neck they are wrapped around. Many of them have fringes at the ends while others have a nice border. This contributes to their long life and easy of care in maintaining their appearance. The designs on the scarves vary, but include many different styles of cats, rainbows, horses, butterflies, fairies, and leopards to name a few. This variety makes it possible for the ladies to mix and match them to their present mood when they wish to wear them. An item that was created by Ms. Burch for the ladies to wear in the privacy of their own homes is her line of socks. These are made out of a cotton blend that will comfort the feet of any woman that wears them. To help in the level of comfort, there are even sock slippers. These are made out of same comfortable cotton blend but have added non-slip padding on the bottom for safety purposes and help the slippers to last for years into the future. 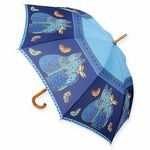 For those raining days there is also the very stylish Harmony Under the Sun umbrella. This only comes in one style, but the two types include compact and standard umbrella. This is fashioned to match most of the other works of art that Laurel Burch created that a lady could be wearing. For those of you desiring Laurel Burch art on your walls, she also created many paintings in her lifetime. This is where a majority of the inspiration for the many items of Burch art originate from. She let out her inner thoughts and beauty onto canvas. These original works of art are now expensive, but prints are available that are more reasonably priced.